In the first glimpse, this image exploded into my visual cortex and took hold of my psyche like a black ops team storming an enemy hideout. Many will sympathize with the young boy depicted here; few are brave enough to admit relating to the hand around his neck. The boy is being choked by a hand with hurtful, degrading language its flesh. 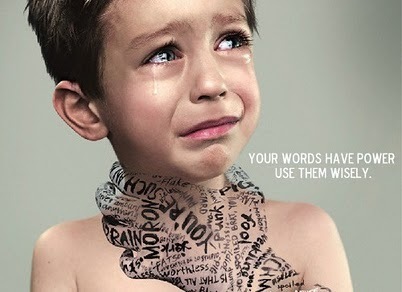 Hate-filled words are the Botulinum toxin to the emotional health of a child. The consequences of poorly selected vocabulary and the tone in which we speak are indistinguishable. “I love you” served with a contemptuous disposition will emotionally disembowel a person as efficiently as “I hate you”. Imperative to nurturing our relationships is understanding the trauma caused by reckless words is not limited by one’s age. Even the elderly war veteran, with skin like a rhinoceros, can sustain mortal wounds from a verbal hand grenade. After the smoke has cleared, emotional lacerations left by a mouthful of jagged shrapnel do not heal quickly or easily. Each of us has a monster living inside. Some have successfully executed the beast, cautiously watching for its resurrection. In some, it lives as a caged animal; controlled but alive, patiently waiting for an opportunity to escape. Still others allow it to roam free. This creature is a gluttonous carnivore with an unquenchable appetite for authority. The insatiable need to be right, the ravenous drive to be dominant, that is our predator. Voracious pride is a beast that thrives on inciting emotionally charged confrontations and cloaks itself in the skin of its virtuous doppelgänger, confidence. Confidence educates and inspires, pride dictates and intimidates. Confidence is the catalyst for progress, pride is an obstruction that fortifies itself against divergence. Failing to conquer the beast sows acres of contempt that metastasizes into harvests of regret. Be well aware of the words you use, the way you convey them, and your objective for using them. Then confirm they were received as you intend, accepting responsibility and rectifying the situation if they were not. Communicate calmly and carefully because life doesn’t come with auto-correct.